I am not a fan of that cover. That's... pretty wonky looking. I was really anticipating this cover too. Courageous choice to go with that angle but I don't think the final result is much of a success. The comparison to the original color illustration just above makes it all the more painful. Cool artwork, poor cover. Let's say it could have been more subtle and enigmatic. I don't mind it. I like the first image more, but I'm fine with this one. Besides, it's what's inside that counts. Looks like me and the fiancée will be stopping by Kinokuniya sometime in August. Agree with everyone about the cover. I do feel the coloring on the original illustration is more subtle (eyes, skin tone) in comparison to this one. I like the placement of the title in the middle, wide across and the font color for it, looks regal. Excited to read the series in a volume. I think it was quite brave to NOT put Goura on the cover. I've been pretty vocal about this on the podcasts, but I think Goura's design and the episodes that feature it are the standout pieces of Gigantomakhia. It's of course fitting that the cover features Prome and Delos, given their quest and their relationship, but that's not necessarily the most marketable aspect of the series. Also there's something off about the colors here. Miura generally (always) paints his covers. This one doesn't look painted, or if it is, it's hard to tell given the resolution. I wonder if this is his colorization or someone else's? I expect that other color image of Prome will end up as a poster. If so, wonder what the reverse side will be..? I'm pretty sure it's a painting, the colors are probably due to the image and not the work itself. If you'll remember, the preview of volume 35's cover had neon green tentacles on it, while the real deal was a lot more subdued. I don't expect any miracles, but the actual cover will probably be a bit more palatable. I think it was quite brave to NOT put Goura on the cover. I've been pretty vocal about this on the podcasts, but I think Goura's design and the episodes that feature it are the standout pieces of Gigantomakhia. Agreed. Putting Prome alone on the cover would have been ''riskier'', way more subtle but less attractive when putting Goura would have been obviously attractive but would partially ruin the exposure. Damn, you know, this cover runs into a lot of the same problems as Berserk's volume 36. Dynamic angle, but Delos just doesn't resemble himself. I can see what Miura's attempting to do, but it seems to age his characters prematurely. Prome looks pretty cute, though. I actually quite like the cover. Prome looks more alien/android in this then the original. She also looks much older, maybe this is from the time when Delos first met her when she looked more like a woman? The only gripe i have is that Delos looks wayyy older but its a small nit-pick. I can't wait to get mine. The way Delos is depicted on the tankobon cover art somehow reminds of the manner Guts was also shown on the first volume cover of Berserk, which in of itself wasn't exactly the best of Berserk covers. You only see the head, and the cloak-covered shoulders. Nothing else. The rest of the body is absent altogether. The way Delos is depicted on the tankobon cover art in a way reminds of the way Guts was on the first volume of Berserk, which in of itself wasn't exactly the best of Berserk covers. You only see the head, and the cloak-covered shoulders. Nothing else. The rest of the body is absent altogether. Ouch! To be fair, I think Miura still exercises his trademark skill in this cover, which might not be as obvious right now due to the lower resolution. The details in Prome's face, for example, are very delicate. I think that he was trying to do something different and it backfired a bit. It's too bad that it didn't work out, but I do like that he continues to experiment with the limits of his skill as an artist. I think that's a good sign. 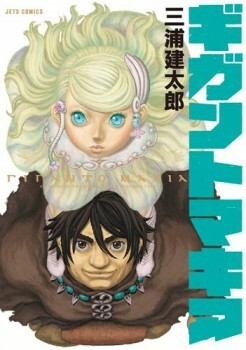 Yes, Miura's always been rather experimental with his covers, trying out different styles and such. And he often goes out of his comfort zone in general, especially when it comes to angles and perspective. I think Johnny Apples' criticism is overly harsh here and doesn't take the difficulty of that angle in consideration. Not that it excuses everything of course. P.S. I like volume 1's cover. Ahahaha, well, not to say that I'm completely hating on the Gigantomakhia's cover art. On a positive side, at least the font size and the coloring scheme of the title's katakana rendition looks very good, and has an aura of classic old school action manga to it. That counts, right? And I admit, it's a pretty neat visual angle trick, making both main characters on the cover appear as if they are looking up and ahead, all at the same time. If you were to ignore the rest of their bodies and just look at their heads, you might think that they're standing in front of you, rather than below you. But Delos? On that cover, the poor guy's face hardly resembles how he originally looked in the manga. He appears much more cartoonish, and far less three dimensional here than he is in the manga. His head is very round and looks smaller than it's supposed to be, and combined with the weird facial expression and the way his eyes and facial features are shaped and sized, ironically enough, he's the one who ends up appearing more child-like. Again, this doesn't look like Miura's work as we know and have come to expect of him. Here, it's as if Delos has just been drawn by one of those Studio Gaga assistants guys, who are normally relegated to doing the backgrounds, and got no business whatsoever drawing anything forefront and center-stage. And I think this is what bothers me and many others about this particular cover. Miura, having mastered throughout his career all the ins and outs of his craft, he knows how to draw anything and everything, from video game covers to postcards. He could have easily come up with something far better than this, something exciting looking, a cover that is fluid, kinetic and maybe depicting intense fighting action. Like some of the Berserk tankobon covers from the past 10-15 years, for example. The Gigantomakhia appears not so much an "experimentation gone wrong" as it is an example of messing with the reliable (and decades-long perfected) formula that works. Even that inscribed Gigantomakhia art page below on the left, had Miura colored it, would have made for a better looking tankobon cover. But Delos? On that cover, the poor guy's face hardly resembles how he originally looked in the manga. He appears much more cartoonish, and far less three dimensional here than he is in the manga. His head is very round and looks smaller than it's supposed to be, and combined with the weird facial expression and the way his eyes and facial features are shaped and sized, ironically enough, he's the one who ends up appearing more child-like. I completely disagree with what you're saying. If anything, Delos appears to be older on the cover than he does in the manga, and the style of the cover goes for a somewhat more "realistic" style too, or at least not a more cartoonish one. And I think this is what bothers me and many others about this particular cover. I don't believe you speak for anyone but yourself here. Miura's done some less-than-perfect covers before, and as Grail mentioned this one is actually reminiscent of volume 36's. Stop making wild assumptions when you clearly have nothing to back up what you're saying. "Decades-long formula" for Berserk covers? There's no such thing. Young Animal's Facebook page showed the cover in a slightly different color - seen here. That color picture sure makes Prome look even more android-like. That Gigantomakhia trailer reminds me of some kind of Berserk alternative rock AMV. Young Animal's Facebook page showed the cover in a slightly different color. Hmm, is it some kind of special edition of the cover? I dont mind the green on the eyes and logo but the hair and dress seems a little too much unless its suppose to look different in person. Glow in the dark maybe? Having the logo and Prome's android-like eyes glowing in the dark staring at you, that'd be pretty neat. Once again they refrain from showing off Goura. That's so insanely ballsy.